Jeff Ryan, a Maine based author, speaker, and photographer, has a contagious passion for exploring the outdoors, particularly on foot. Jeff has hiked thousands of miles including his first “trip of a lifetime”, a 6-month hike on the Pacific Crest Trail. In 1985, Jeff began “section hiking” the Appalachian Trail with a childhood friend (a journey that would take years to complete and inspired his first book, Appalachian Odyssey: A 28-year hike on America’s trail, released in 2016 by Down East Books). His AT experiences inspired him to learn about the dynamic relationship between Benton MacKaye and Myron Avery that culminated in the creation and completion of the legendary trail. His second book, Blazing Ahead: Benton MacKaye, Myron Avery and the Rivalry that Built the Appalachian Trail (published by Appalachian Mountain Club Books) was released in 2017. 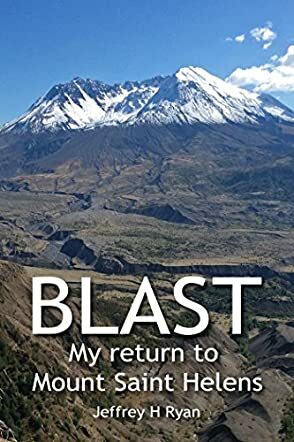 In 2018, he wrote, Blast: My Return to Mount Saint Helens, an eBook chronicling his two climbs of the legendary mountain (in 1987 and 2017). In between hiking trips, public speaking engagements and book signings, Jeff travels throughout North America in his 1987 VW Vanagon. Blast: My Return to Mount Saint Helens is a nonfiction memoir written by Jeffrey H. Ryan. Ryan is an outdoors enthusiast, writer, photographer and lecturer, who’s hiked thousands of miles of trails including the Appalachian and Pacific Crest Trail. It was during his Pacific Crest Trail hike in 1983 that Ryan first saw Mount St. Helens. The eruption of that volcano three years earlier had been far more devastating than anyone had anticipated due to the fact that a major landslide, which had been set off by an earthquake, sheared off one side of the mountain. The pressure of the building magma flow burst through that weakened section, causing an explosion of rocks and heated gases that spewed sideways over the surrounding landscape rather than upwards as in a more typical scenario. When Ryan and his hiking companions reached the area seven years after the blast, they were stunned to see it was still “a slurry of impacted sand and rock.” They hiked through deep ash to get to the summit which was still an unforgettable experience. Thirty years later, Ryan came upon a video of that 1987 trip and decided it was time to return to Mount St. Helens and see what the decades had done to heal the surrounding countryside. He contacted the hiking partner who had been with him on that trip, and a plan was made to set out in September, 2017. It would be just a few weeks after the 30th anniversary of the eruption. While an unexpectedly early snow event caused a few complications, the two of them conducted a full exploration of the blast zone. This book recounts their experiences as they explored the area. Jeffrey H. Ryan’s nonfiction hiking memoir, Blast: My Return to Mount Saint Helens, is a fascinating look at the science behind the 1980 eruption and the impact it had on the area. Ryan’s accounts of the event and his hiking experiences, both in 1987 and thirty years later, are beautifully written and made both the eruption and those hiking adventures come alive for me. Ryan’s photographs are marvelous and go a long way towards helping the reader understand the immensity of the event. That picture of a valley littered with full-grown trees that look like toothpicks in their multitudes is unforgettable, as are the images of Spirit Lake and the floating blanket of trees. Nothing compares to being out on the trail oneself, but, failing that, reading a memoir this good with the caliber of photographs shared by the author comes just about as close as one can to the actual experience. Blast: My Return to Mount Saint Helens is most highly recommended.